I disagree.. bwaha! Here’s a different perspective – Hung on a twine garland around a summer patio with twinkle lights in between for a kitschy vintage vibe. 2nd thought – same garland in a white walled aqua and coral vintage home like Dottie Angel’s. SO cute ! On a Christmas tree.. yeah not feeling it. that does sound cute! I have lantern lights in my backyard; maybe i should couver them for a spring party or something. 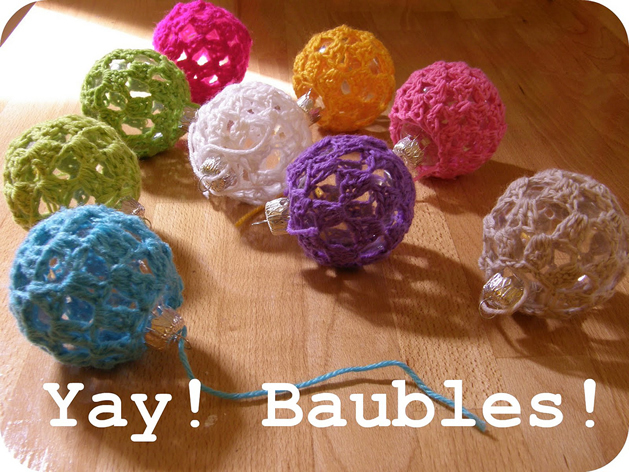 And i think ornaments would look cute with a bit of a more delicate yarn, what do you think?